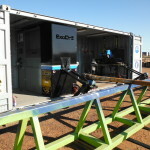 The EXODRILL fully portable unit is robustly designed to handle the harsh conditions encountered with regular travel and operation in remote locations. Our custom built, new generation unit includes a semi-automated welder and an in-built grinder for effective, safer and quicker removal of existing worn/damaged hard banding in preparation of the new application. Built for stand-alone operation, the unit carries a diesel generator to control lighting, hydraulics and all other equipment. 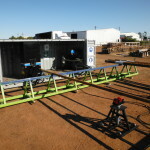 Being completely self-sufficient, the unit is easy to locate on site and capable of running 12-24 hour operations for quicker tubular turnaround. We are accredited applicators of ARNCO 350XT, ARNCO NonMagXT, and TUBOSCOPE TCS-Titanium to suit our client’s needs.